Tonight at 7 o'clock, the Aardvarks will gather in front of the tube for a full hour with Charlie Brown, Snoopy, Linus and Lucy, Sally, Pigpen, Schroeder, and the rest of the Peanuts gang as they present the fortieth annual televised presentation of A Charlie Brown Christmas. I was only eight years old (or "almost nine," as I certainly would have told you) and we'd only had TV in the house for a couple years when this truly special special first aired. I don't know that I've missed it more than a time or two since then. I noticed in the TV listings at My Yahoo that it will show again on 16 December, for those who want to double-dip. I don't know about the repeat broadcast, but tonight stretches into a full sixty minutes (commercials included). 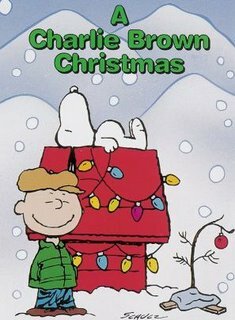 After fade to black, ABC follows up with Charlie Brown Christmas Tales, featuring a vignette of each Peanuts character. There may be more sophisticated animation, faster pacing, or deeper drama in other Christmas shows and films, but I can't think of one seasonal offering I welcome more. If you can't wait, check out the above-linked entry at Wikipedia or visit the show's listing with IMDB. I'm happy I did: After all these years, I just learned something new. According to the trivia link, "During his famed speech, Linus, who is well known to be dependent on his 'Security Blanket', actually lets go of it when he recites these words: 'Fear not: for, behold, I bring you good tidings of great joy,' which is from Luke 8:10 [sic; should be 1:10]." "Fear not!" The Church is not a "family special," but a special family. All who, by grace, are part of it are blanketed with the security of forgiveness, life, and salvation which are our nativity gifts from the One Incarnate God, our "Savior, who is Christ the Lord. (Luke 1:11 ESV)" In your Father's house, you can come to Him, letting go of your worthless human "security blankets," and cast "all your anxieties on him, because he cares for you. (1 Peter 5:7 ESV)"